FULTON, NY – Rockford, the pit bull puppy, is recovering after his severed jaw was surgically repaired. â€œRockford is doing much better, considering what heâ€™s gone through. He is spending his time recuperating, just hanging out at the shop,â€ said Rachel Dean one of the puppyâ€™s rescuers. 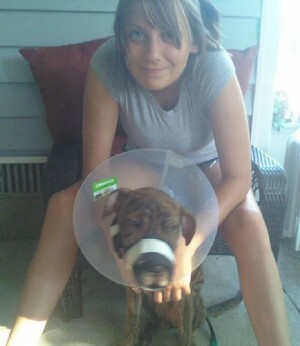 Rockford, the pit bull puppy rescued by Rachel Dean, is much improved following surgery to repair his severed jaw. In a few days the protective cone he has had to wear will be removed and he can start eating solid foods again soon. She is now his legal guardian after he was discovered in need of medical attention in the vehicle of one of Absolute Auto and Audioâ€™s customers. The man voluntarily surrounded the six to eight month old dog to her. Rockford is starting to put on some weight and maintain it, Rachel said. â€œHe is up to 27 pounds. He was just one-third the weight of what he should have been when we found him,â€ she said. He has to go back to the vetâ€™s in a few days for a post-surgery checkup. The puppy recently went through five and a half hours of surgery. Cornell surgeons installed plates and screws into both sides of his jaw; six on either side, Rachel said. A day after the surgery, he was able to move his jaw and ate wet food on his own. He is very obedient and responds to his name, Rachel said. Itâ€™s possible he may need hip surgery where the bone was previously injured. â€œWe are doing good on donations,â€ Rachelâ€™s fiancÃ© said. The jaw surgery cost about $3,700. More than twice that amount was raised in donations for Rockford. Rachel said the additional funds will be saved in an account for Rockfordâ€™s future surgery, if necessary; and she added, some of the money could be used for other animal causes. Hopefully, this week, the protective cone Rockford has had to endure for weeks will come off. â€œStill weâ€™ll have to be careful with him. When weâ€™re not around to keep an eye on him, we have to keep him separated from my other dog. Heâ€™s just a puppy, and some times puppies play too rough. We donâ€™t want him re-injuring himself,â€ Rachel said. The man accused of abusing the pit bull pup, Reginald Stepp, 35, of Milton Avenue, Syracuse, appeared in court where his case was handed over to an Onondaga County Grand Jury. Stepp is being held on several animal cruelty charges including a felony charge of aggravated animal cruelty. Thank you for caring for Rockford! He is a lovely dog and I hope his previous abuser is punished hard! I did donate and would be happy to be a part of your idea to establish some type of shelter for these dogs who didnt ask to be abused. It seems that these type of people want to feel powerful- so they have to abuse a child or animal. Shame on those who do this……..my advice to these idiots is to go out and smack a tree or hit a brick wall……that’ll teach ya! Further more, what do you think these poor dogs think when you are doing such painful things to them…….ALL dogs aim to please their owners…..they only learn to become vicious when the COWARD who owns them continually beats, kicks and starves them…..SHAME ON YOU REGINALD STEPP!!! The owner of this dog is a villain, but you know, almost without exception, there was some violence done to the abusers. Think about what happened to this little pup happening to the child Stepp may have been. There is reason to pause. The truth is, not enough people come to these animals rescue (many fear getting involved, and why i think the new owners are heroes). This dog is going to endure quite a bit more pain, before he comes out on the other side. In old age, he will probably suffer arthritis from the damaged joints (including the hip area). So, it is a blessing he has such a lovely disposition. I pray for him. But I also pray for those people who are so angry that they will harm animals. WHAT has been done to them? How horrible that the cycle continues, and in the case of the abusers, mental illness of a sort, transpires. I gave a little something for Rocky. I have 9 animals of my own, a dog abused, but thankfully, not quite so much. He is my second abused dog (another, a beagle, had to have several surgeries, one major one from having been hit by a car on Route 48 because the owners allowed her to ‘run.’ I didn’t pay for it, it was the woman who adopted her before me (and then died), but I know what this beast went through due to her early privations). My newest dog, a seven year old, is only recently not snarling, and growling when a stranger walks by our house. It took six of those years to trust that no one was going to come and beat him! Everyone, including the postal carriers thought we should have him put down. But we believe it wasn’t his fault. And we were right. He has a good soul, and he’s finally able to show it (he always did with us!). He now smiles, and plays with his squeaky toy to let us know how very happy he is. So, Rocky’s good nature is a gift from God. A miracle. And his new owners, thankfully, recognize this. Thank you for sharing Rocky’s story. And allowing us to help him (and possibly more beasts that the money may go to! ).